Essex County was formed in 1675. The boundaries were first determined in 1709-10 and as then established included what is today known as Union County. The land constituting Essex County was purchased from the Indians by the settlers of the City of Newark for fifty double hands of powder, 100 bars of lead, 20 axes, 20 coats, 10 guns, 20 pistols, 10 kettles, 10 swords, 4 blankets, 4 barrels of beer, 10 pairs of breeches, 50 knives, 20 horses, 850 fathoms of wampum, 6 anchors of liquor, and 3 troopers' coats. On the Passaic River, three miles north of Newark. Founded prior to 1682 and once known as Second River. Scene of battle September 27, 1778. Three and one-half miles from Newark. During the Revolution, Bloomfield was the scene of acts of violence and plunder on the part of the Tories. The Presbyterian Church in Bloomfield was erected in 1796. Corner of Bloomfield and Liberty Streets. Memorial tablet to General Joseph Bloomfield dedicated November 10, 1923, gift of Major Joseph Bloomfield Chapter, D.A.R. The town of Caldwell is notable as birthplace of Grover Cleveland, twice President. Settled May, 1666 by settlers from Guilford, Branford, and Milford, Connecticut. Named Newark in honor of the Reverend Abraham Pierson, Pastor of the settlers who came from Newark, England. Barbour and Howe state the purchase price of the original township of Newark as 130 pounds New England currency, 12 Indian blankets, and 12 Indian guns. 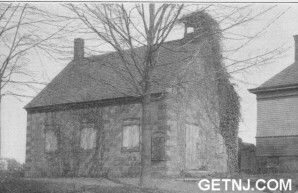 First School House Erected in Newark The people of Newark May 18, 1775, agreed not to export to Quebec, Nova Scotia, etc., or to furnish provisions to the King's ships or boats. In the Winter of 1778, a detachment of the second battalion of the Continental Army was stationed at Newark. An engagement took place here January 25, 1778. The first church erected in Newark, that of the Rev. Mr. Pierson, built in 1668, on a lot opposite to the present Presbyterian Church. The first Presbyterian Church had, as its pastor about 1736, the Rev. Aaron Burr, father of Aaron Burr, Vice President of the United States, born at Newark September 24, 1757. The Protestant Episcopal Church in Newark originated in 1734, being organized by some Episcopalians and dissatisfied Presbyterians, one of whom Colonel Josiah Ogden had been disciplined for saving his grain on a Sabbath in a wet harvest season. As a result of this organization, Trinity Church was established. The present church, standing in Military Park, is built on the site of the original church and retains the original tower. The College of New Jersey, now Princeton University, was located in Newark from 1747 to 1756, Rev. Aaron Burr being President from 1748 to 1757. Broad and Market Streets. Residence of William S. Pennington, Major in Revolutionary Army, Justice of Supreme Court of New Jersey 1804, Governor 1813-15, Judge United States District Court 1815-1826. His son, William Pennington, became Governor 1837-1843. Broad Street, East side. Residence of Elisha Boudinot, Associate Justice of the Supreme Court of New Jersey, first depositor in the Newark Banking & Insurance Company, and one of the Associates of the New Jersey Company organized to found Jersey City. Residence of Dr. Uzal Johnson, originally a surgeon in Colonial Service, who became a loyalist but escaped capture. East side of Broad Street. Residence of Judge William Burnett. The Parsonage, formerly stood at Broad and William Streets. Residence of Rev. Aaron Burr and his wife, daughter of the Rev. Jonathan Edwards. Birthplace of Aaron Burr, Vice President of the United States. Occupied by Rev. Alexander M'Whorter during the Revolution and for many years thereafter pastor of the Church. Residence of Peter J. VanBeckel, Minister from Holland to United States. Decatur House. 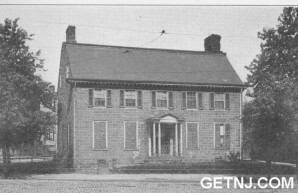 Home of John Decatur, brother of Commodore Stephen Decatur who came to Newark to take part in the fox hunts and hunt balls at the Gifford Tavern, northeast corner Broad and Market Streets. Petersborough on the bank of the Passaic River -- erected 1735. Home of Colonel Peter Schuyler, an officer in the French and Indian War. Cockloft Hall, near Petersborough. Erected 1750 by Nicholas Gouverneur. Tradition says that it is described in the Salmagundi Papers by Washington Irving and some have even claimed that the papers were written there. Bronze tablet marking camp ground of Revolutionary soldiers erected here by Nova Caesarea Chapter, D. A. R., at Philip's Park, Elwood Avenue, Newark. Three and one-half miles northwest of Newark. Founded about 1720. Old First Church, corner of Main and Day Streets. Revolutionary Burial Ground with monument of dispatch rider by Elwell. Home of Thomas A. Edison. Old Crane Homestead, Washington's Headquarters October 26, 27, 1780. Marked by tablet erected by Eagle Rock Chapter, D.A.R.